What is Digi-Bridge and how did you get involved? Digi-Bridge is a nonprofit organization based in Charlotte, NC that is focused on bridging the digital divide. Our goal is to level the playing field to ensure equitable access to modern technology. We focus on the learning environment, so much of our work takes place in schools and classrooms. As a Teach for America Corps member in 2009, I discovered the disconnect (both literal and figurative) between student needs and access to resources in schools. I quickly identified technology as space where we could move the needle forward in a progressive and impactful way. Digi-Bridge was founded out of this realization. Consultancy – We consult with educational institutions on digital classroom design. Course offerings – We offer STEAM (Science, Technology, Engineering, Arts, and Math)programming throughout the Charlotte area for college and career readiness. Advocacy – We advocate for affordable tech options for families (particularly those with school aged children), affordable internet for the home, and the introduction of computer science into the K-12 learning environment. As of 2014, at least 20% of Charlotte was not connected to the internet. That number is shocking. I was also surprised to find that no organization in Charlotte had a team of experts whose sole focus was to vet and filter hardware and software recommendations for their clients. That is what Digi-Bridge does in its work to increase technology access in the Charlotte area. Why do you think RWCI is a good partner for your work? One of the things that sets us apart from other educational providers is our ability to remain in the agile startup mentality. We know that in order to be successful we need to keep iterating and exploring opportunities, particularly in the STEAM arena. Digi-Bridge and RWCI both emphasize the importance of teaching students how to “fail well,” because inquiry and trial-and-error are such a huge part of exploration in the STEAM fields. The traditional practice of grading on an A-F scale doesn’t teach the mindset needed to be successful in the modern, STEAM-oriented world. We have to shift our practices if we want to provide kids with truly hands-on, transformative experiences. Together, we are a team of passionate educators and leaders working tirelessly to develop curricula that are at the forefront of education, keeping up with emerging technologies around the globe. Tell us about the recent event you hosted with RWCI. We recently hosted a Karma Course at RWCI, where we piloted a “pay what you can” model of programming. The event was a culmination of conversations between board members and community leaders who wanted to do something for communities who don’t have the financial means to secure technological equipment or the classroom space for their kids. Students learned about Scratch programming language and explored basic Lego robotics. The workshop was scheduled to last an hour, but ran for 90 minutes because the kids loved it so much – we could have stayed all afternoon! What are your plans for your work with RWCI? What do you hope to achieve? After the event the Digi-Bridge team performed a SWOT analysis. We would like to continue to offer Karma Courses at RWCI. We would like to identify a partner to sponsor the Karma Course so it can become a sustainable year-round program rather than a volunteer-based effort. We plan to build out course offerings at RWCI to create a pipeline of well-informed, well-prepared students with a technological skill set that will accentuate what they learn during the academic day. Are there any other exciting initiatives in process or on the horizon that we should be aware of? Do you want to give a shout-out to any other partners you think are doing great work in the community? 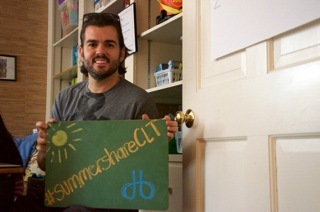 Here’s a recent photo of me – Shout out to SHARE Charlotte and their #summershareCLT project. Nonprofits like Digi-Bridge were able to create Amazon wish lists and community members were able to shop to help us stock our offices with essentials.